Click here to view race results including free pictures of your run! We want to thank Erin Mascaro, Event Co-Chairperson/Race Director and Trish Beaumont, Event Co-Chair, for organizing such a successful 9th Annual Sounds of Silence 5K Run. Thank you also to all who participated: runners, walkers, stroller-walkers, sponsors, volunteers, friends and supporters. 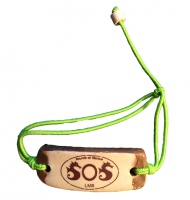 And, a special thank you to our amazing SOS Volunteers for all their hard work and dedication in making this the best Sounds of Silence 5k Run ever! If you didn't get to chance to make a donation in support of this event or would like to make another one, please know that you can we are accepting donations until midnight of May 31, 2017. Please click here to reach the 9th Annual Sounds of Silence 5k Run event online donation page (or copy/paste https://grouprev.com/sosrun2017 into your browser). You may also send your donation by check. Please make it payable to: Postpartum Resource Center of New York. 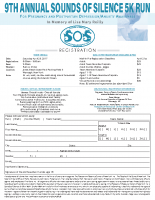 Mail check to: Postpartum Resource Center of New York, Attn: SOS 5K Run, 109 Udall Road, West Islip, NY 11795. 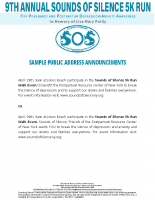 The 9th Annual Sounds of Silence 5k Run (Run, Walk, Stroller-Walk with Kid's Fun Run) at Jones Beach State Park, Field 5, will take place on Saturday, April 29, 2017. Click on the button below to register now or download the Registration Form below. After downloading the form, please complete and mail to along with payment. If you are not able to make it to Jones Beach, you can still participate and make a difference by registering as a Virtual Runner! Click on the Register Now button below to take part. All New York State schools and colleges are invited to participate in the 9th Annual Sounds of Silence 5K Run For Perinatal Mood and Anxiety Disorders Awareness. The event takes place on Saturday, April 29, 2017 at Jones Beach State Park, Field 5, in Wantagh, New York. The course takes runners / walkers and stroller-walkers on a 5k course on the wonderful Jones Beach Boardwalk that features beautiful views of the beach and ocean. Following the 5k run, there will also be a Kids Fun Run. Free pre and post race snacks are provided. 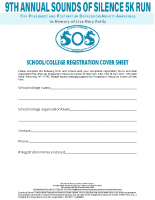 + Individual Student Registration Form. Please note: Each attending student must complete the registration form and his or her parent/guardian must sign the waiver. Registration form must be completed and returned with payment by April 21, 2017 to receive the discounted rate. 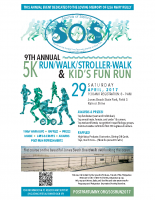 Join us on Saturday, April 29th at Jones Beach State Park, Field 5, for the 9th Annual Sounds of Silence 5k Run (Run, Walk, Stroller-Walk with Kid's Fun Run). Become a Sponsor in an event that benefits your customers – moms, dads, and families on Long Island and throughout New York State. Complete details are in the sponsorship form below. 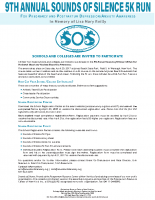 Please click on the form below to view and download. Secure your Sponsorship now using the secure form below or download and complete the pdf form below and pay by check. Please make check payable to: Postpartum Resource Center of New York. 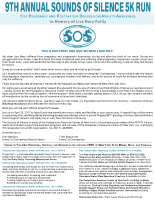 Mail to: Postpartum Resource Center of New York, Attn: SOS Run 2017, 109 Udall Road, West Islip, NY 11795. 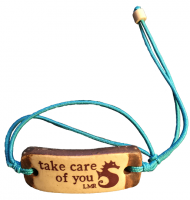 Seahorse Sponsor($1,000) — Corporate logo on race T-Shirt | Distribution of marketing materials and/or product samples in race swag bags (500 bags) | Logo link on registration website and PRCNY website | Social media recognition | Facebook, Twitter, plus email. Thank you Bulldog, Chapey & Sons Funeral Home, The Donaldson Organization for your sponsorships! T-Shirt Logo Sponsor ($300) — Corporate logo on race T-Shirt. Thank you to all of our T-Shirt Logo Sponsors! See list above. All artwork (logos etc.) must be submitted by March 31, 2017. Please email artwork to: info@postpartumny.org | Preferred logo art formats (Vector - Adobe Illustrator .ai or .eps). Acceptable logo art formats (ai, eps or high-res jpg, png, pdf). Please do not send artwork taken from your website – it will not reproduce well for printed materials. Thank you!